Atlantic coasts of South America and Africa could be fitted together like giant jigsaw pieces. In 1912, Alfred Wegener marshalled a great deal of geological and palaeontological evidence in favour of continental movements. He focused in particular on an ancient supercontinent called Gondwana (Figure 2.7). Palaeontologists had found similar fossil plants, members of the Glossopteris Flora, and reptiles, such as the dicynodont Lystrosaurus, in rocks of Permian and Tri-assic age in Africa, South America, India and Australia. 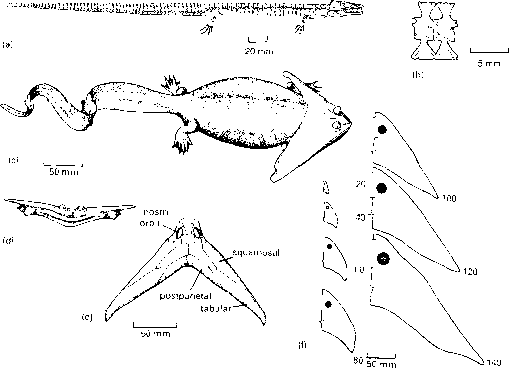 The small freshwater reptile Mesosaurus from the Early Permian was known only from a limited area on the coasts of Brazil and west Africa. The normal explanation at the time was that these plants and animals had been able to travel great distances between those southern parts of the world. More difficult to explain was how the Late Permian Glossopteris Flora could exist both in the southern hemisphere and across the equator in India. Wegener argued that the southern continents had once been united, and the Permo-Triassic plants and animals had more limited geographical ranges. He recognized a northern supercontinent called Laurasia, and he showed that Gondwana and Laurasia together formed a single global supercontinent, Pangaea, which lasted from the Late Carboniferous to the Late Triassic. Wegener's ideas were not uniformly welcomed at the time because the driving force for continental drift could not be identified. The motor was discovered about 1960, however, as a result of geological investigations of deep ocean floors. Fresh oceanic crust was found to form from molten rock along the mid-oceanic ridges, and the ocean floor was moving apart slowly and evenly away from these ridges. Earth's crust is divided into a number of plates, some major ones corresponding to the continents and oceans, and many minor ones. Fig. 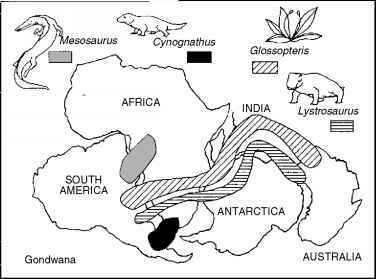 2.7 Reconstruction ofGondwana as it was from the Late Carboniferous to the Late Triassic, based on the work of Alfred Wegener, showing how this arrangement of continents makes sense of the distributions of Permian reptiles such as Mesosaurus,Permian plants such as Glossopteris, and Triassic reptiles such as Lystrosaurus and Cynognathus.